Jerald Yoo received the B.S., M.S., and Ph.D. degrees in Department of Electrical Engineering from the Korea Advanced Institute of Science and Technology (KAIST), Daejeon, Korea, in 2002, 2007, and 2010, respectively. From 2010 to 2016, he was with the Department of Electrical Engineering and Computer Science, Masdar Institute, Abu Dhabi, United Arab Emirates, where he was an Associate Professor. Since 2017, he has been with the Department of Electrical and Computer Engineering, National University of Singapore, Singapore, where he is currently an Associate Professor. He has developed low-energy body-area-network (BAN) transceivers and wearable body sensor network using planar-fashionable circuit board for continuous health monitoring system. He has authored book chapters in Biomedical CMOS ICs (Springer, 2010) and in Enabling the Internet of Things—From Circuits to Networks (Springer, 2017). His current research interests include low-energy circuit technology for wearable bio signal sensors, flexible circuit board platform, BAN transceivers, ASIC for piezoelectric Micromachined Ultrasonic Transducers (pMUT) and System-on-Chip (SoC) design to system realization for wearable healthcare applications. Developing energy-efficient integrated circuits and systems for biomedical applications is the focus of the Jerald’s group research. Current research projects include low-energy circuit technology for wearable bio signal sensors, flexible circuit board platform, BAN transceivers, ASIC for piezoelectric Micromachined Ultrasonic Transducers (pMUT) and System-on-Chip (SoC) design to system realization for wearable healthcare applications. 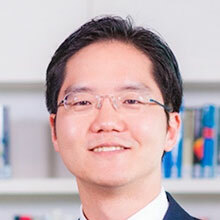 A/Prof Yoo is the recipient or a co-recipient of several awards: the IEEE International Circuits and Systems (ISCAS) 2015 Best Paper Award (BioCAS Track), ISCAS 2015 Runner-Up Best Student Paper Award, the Masdar Institute Best Research Award in 2015 and the IEEE Asian Solid-State Circuits Conference (A-SSCC) Outstanding Design Awards (2005). A/Prof Yoo was the Vice Chair of IEEE Solid-State Circuits Society (SSCS) United Arab Emirates (UAE) Chapter. Currently, he serves as a Technical Program Committee Member of the IEEE A-SSCC, IEEE Custom Integrated Circuits Conference (CICC), and the IEEE International Solid-State Circuits Conference (ISSCC) Student Research Preview (SRP). He is also an Analog Signal Processing Technical Committee Member of IEEE Circuits and Systems Society.